"My agency told me on that day that my hips were way too wide." The Instagram era feeds us the illusion of people having #blessed lives and always having the best time, but what really goes on behind the scenes? 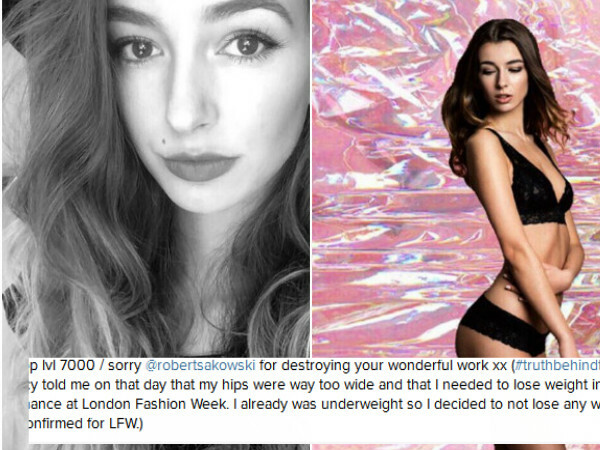 A London based model, Jazz Egger, seems to be stripping all dark ‘fairy-tale’ perception of modelling by re-captioning her Instagram pictures to tell the truth about modelling. The Austrian-born model started strutting the runway at the tender of age of 13, taking part in shows like Germany’s Next Top Model as well as making it to the finals of Elite Model Look. The 19-year-old told Metro that and as she grew older she started realizing the dark truth behind the sought after fashion industry and she wants to tell people about the ‘behind-the scenes’ and the ‘pressure to be underweight’ truths of modelling. “I get so many messages from young people who ask me how they can lose weight or other beauty questions. As a way to pave a positive way for many young girls who want to be in the modelling industry, Jazz started using the candid hashtag #truthbehindthisshot to unearth all her struggles in the glitzy and glamorous modelling world. Jazz is a UK size 6 and while she is not as confident about her body yet, she hopes her 18 000 followers will gain confidence and spread positive images of their bodies. “Beauty standards are hella stupid. And what's going on behind the scenes of the industry is even crazier,” she told DailyMail. Sadly, Jazz told Metro that she doesn’t enjoy posting her pictures on the photo sharing app, but she is forced to do so to build her modelling profile. “[I don't know] how to feel about this but they this is me dropping a selfie to stay in the game,” she captioned one of her photo’s. While she may voice out the displeasure she gets, her pictures have been flooded with many support and positivity from her followers. “I think, even if only one single person thinks about my words and changes their mind when it comes to the fashion and media industry, I already feel like I'm doing the right thing,” she said.